A Disney Cruise Line vacation gives you and your family many ways to play together and separately. Although you can enjoy time together, it's also good for kids (and you) to have time alone or with others in their age group in the Disney youth clubs. For kids, the Disney Cruise ships offer nonstop fun most of the day and into the evening at different locations for five separate age groups. The youth programs and activities on the Disney Magic are very similar to those found on the other Disney cruise ships. The youth programs are also similar to youth programs found at shoreside resorts. This nursery is for children ages 6 months to 3 years. For some longer sailings, children must be 1 year old or older. Available at an additional charge, It's a Small World Nursery lets you take part in grown-up adventures on and off the ship while your children are cared for by trained Disney counselors. Operating hours may vary while in port, so you should check the Personal Navigator—the Disney Cruise Line daily newsletter and app that details all there is to see and do—once onboard. The acclimation zone is designed to help youngsters adjust to the nursery. The main play area has a soft surface floor surrounded by colorful, kid-sized tables and chairs for toddlers to enjoy crafts, books, and games. It also has a three-dimensional façade of the "it's a small world" Disney attraction filled with hidden, interactive delights. There's a quiet and peaceful separate room for naps. Activities at It's a Small World Nursery are unscheduled and vary depending on the mood of each child. Counselors lead programs such as movie time, story time, and craft projects. It's a Small World Nursery is available at an additional charge and you must reserve it in advance. If you've already booked your Disney cruise, simply log in, retrieve your reservation, and find out when you can begin making reservations in My Cruise Activities. You can also make a reservation during the open house on Embarkation Day on a first-come, first-serve basis. Because space is extremely limited, be sure to book your child's nursery time early. You should bring baby food, formula, milk, and bottles. Disney's trained counselors are available to feed your child. Additionally, you should include diapers or training pants, diaper wipes, extra clothing, and a baby blanket or pacifier, if applicable, when dropping off your child. Children ages 3 months to 3 years with special needs are welcome at It's a Small World Nursery. Disney Cruises cannot provide one-on-one care, but if you let the nursery counselors know in advance, they will accommodate the best they can. Disney's Oceaneer Club is a multi-themed, children's activity center. Open from approximately 9 a.m. to midnight daily, Disney's Oceaneer Club is for children 3 to 12 years of age to learn, play, and interact with others while you're off on your own adventures. Andy's Room—The world of Disney•Pixar's Toy Story comes to life in this colorful space. MARVEL's Super Heroes Academy—Young crime fighters are invited to swoop into this top-secret command post of S.H.I.E.L.D., where earth's mightiest superheroes, The Avengers, train and prepare for special missions. Disney Junior—Children enter the worlds of their favorite Disney Junior friends and play games with other kids. Pixie Hollow—Inspired by the series of Disney Fairies animated films, this fun interactive space transports children to the magical world inhabited by Tinker Bell and her fairy friends. Children have the ability to move back and forth between Disney's Oceaneer Club and Disney's Oceaneer Lab. A secure, kids-only hallway connects the two youth venues, so children can move freely and experience activities between both spaces. Children are invited to partake in a wide range of themed activities available at Disney's Oceaneer Club. While some are recommended for certain age ranges, participation is based on a child's interest level and maturity—not age. As a result of this, siblings and friends ages 3 to 12 can play together without restriction. An endless supply of toys and games, an open seating area for fine arts, and ongoing Disney movies screening on a 103-inch plasma screen make Disney's Oceaneer Club even more magical. Mats for naps are also available. The Personal Navigator details all there is to see and do while onboard with activity dates and times. Open House is an opportunity for everybody to participate in a variety of exciting activities at Disney's Oceaneer Club and Disney's Oceaneer Lab. Guests 13 years of age and older are not allowed into youth clubs, except during these set times. Please check the Personal Navigator while onboard for the Open House schedule. Children are invited to enjoy lunch and dinner at Disney's Oceaneer Club, which can be especially convenient if you're looking for some alone time at Palo. If you plan to partake in the second dinner seating, you can opt to have your children take part in Dine and Play. In this program, children receive their meals earlier and are then escorted by counselors to youth clubs, while you can enjoy your dinner at a more leisurely pace. To participate, you should let your server know upon arrival. Children ages 3 to 12 with special needs are welcome at Disney's Oceaneer Club. 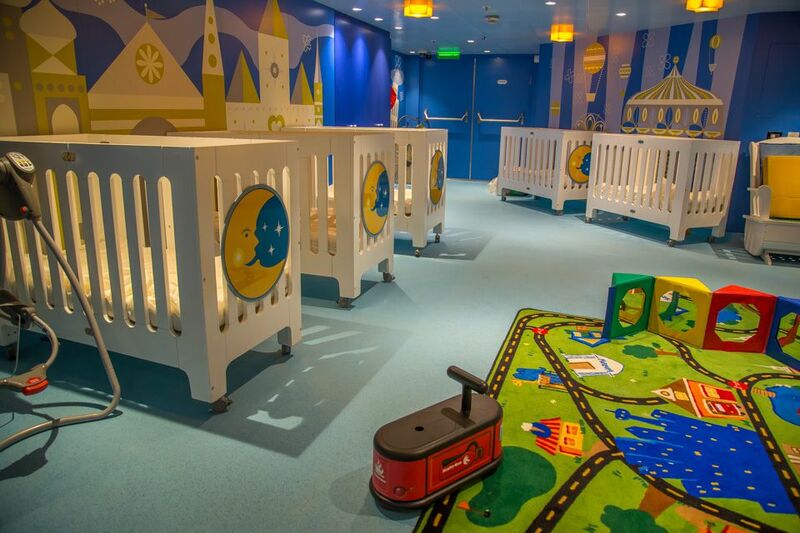 Disney Cruises cannot provide one-on-one care, but if you let the nursery counselors know in advance, they will accommodate the best they can. You can register your child for Disney's Oceaneer Club (and Disney's Oceaneer Lab) at the terminal or once onboard the ship. You can also pre-register online. When boarding the ship on Embarkation Day, you and your children must check in at the terminal or at the front desk at Disney's Oceaneer Club (or Disney's Oceaneer Lab) on Deck 5, Midship. During this confirmation process, you will fill out final paperwork and your children will receive a wristband indicating that they belong to the youth clubs aboard the ship. When registering, you can tour the facility, meet the counselors, and learn more about the many activities offered. Disney's Oceaneer Lab aboard the Disney Magic is a pirate-themed, children's activity center located on Deck 5, Midship. Open from approximately 9 a.m. to midnight daily, Disney's Oceaneer Lab is the perfect place for children 3 to 12 years of age to create, play, and explore while you're off on your own adventures. A 103-inch plasma screen that screens Disney movies. A stage in the main hall, where kids can hear stories of great expeditions and star in their own plays. A pirate workshop where kids can concoct crazy experiments, stretch their culinary skills, and participate in other hands-on activities. Animator's Studio—Designed as a working animation studio, this room is the place for children to create original, hand-drawn art and learn how to sketch their favorite Disney characters. Captain's Workshop—With computers, themed tables, maps, and original buccaneer-styled artwork, this large play area is where food is served and fun-filled activities take place throughout the day. Craft Studio—Children seeking a more tactile artistic experience can escape from technology to this creative studio and create hands-on arts and crafts projects. The Wheelhouse—This area features large LED screens and navigator simulators so children can steer their own Disney ship through the Caribbean Sea. You should note that children have the ability to move back and forth between Disney's Oceaneer Club and Disney's Oceaneer Lab. A secure, kids-only hallway connects the two youth venues, so children can move freely and experience activities between both spaces. Children are invited to partake in a wide range of charming activities at Disney's Oceaneer Lab. While some activities are recommended for certain ages, participation is based on a child's interest level and maturity—not age. As a result of this, siblings and friends ages 3 to12 can play together without restriction. The Personal Navigator details all there is to see and do onboard with activity dates and times. Open House is an opportunity for everybody in the family to participate in a variety of exciting activities at Disney's Oceaneer Club and Disney's Oceaneer Lab. Guests 13 years of age and older are not allowed into youth clubs, except during these set times. The Personal Navigator has the Open House schedule. Children are invited to enjoy lunch and dinner at Disney's Oceaneer Lab, which can be especially helpful if you want some private time at Palo. If you're planning to partake in the second dinner seating, you can opt to have your children take part in Dine and Play. In this program, children receive their meals earlier and are then escorted by counselors to the youth clubs, while you can enjoy your dinner at a more leisurely pace. To participate, you should let your server know upon arrival. Children ages 3 to 12 with special needs are welcome at Disney's Oceaneer Lab. Disney Cruises cannot provide one-on-one care, but if you let the nursery counselors know in advance, they will accommodate the best they can. You can register your child for Disney's Oceaneer Lab (and Disney's Oceaneer Club) at the terminal or once onboard the ship. You can also pre-register online. When boarding the ship on Embarkation Day, you and your children must check in at the terminal or at the front desk at Disney's Oceaneer Lab (or Disney's Oceaneer Club) on Deck 5, Midship. During this confirmation process, you will fill out final paperwork and children will receive a wristband indicating that they belong to the youth clubs aboard the ship. The Edge on the Disney Magic is a children's activity center for kids 11 to 14 years of age located on Deck 9, Midship. Open from approximately 9 a.m. to midnight daily, this interactive play space—a scaled replica of the ship's bridge—lets children play video games, watch television, and participate in arts and crafts. Kids can also sing karaoke, go on scavenger hunts, and take part in special themed nights. The Vibe on the Disney Magic is a teens-exclusive hangout located on Deck 11, Midship. The Vibe is the ideal place for teens ages 14 to 17 to make new friends, play video games, watch television, and enjoy a variety of fun-filled activities throughout the day. Designed to resemble a cozy recreation room in a college dorm or hip urban coffee shop, Vibe is a place created exclusively for teens. Boasting plush couches, large-sized chairs, a dance floor, a mirrored wall, and a bar with stools, Vibe is a haven where teen cruisers can meet, greet, and socialize with people their own ages. Although designated as a teens-only hangout, Vibe is chaperoned by counselors in such a way to make teens feel as unrestricted and comfortable as they can possibly be. Vibe features a full bar that serves a large selection of non-alcoholic beverages, including fruit smoothies, for an additional fee. Soda is complimentary. How Do Disney Characters Dress Up for Halloween?